The kiddo had a blast travelling with these guys…till he got sick, that is. My son has just arrived home from a week long absence as he played a huge soccer tournament in Cebu. He is often travelling to play the sport he loves, competing in the biggest junior events of the Philippines, like Thirsty Cup (this trip), Ceres Cup in Bacolod, Palarong Pambansa in Vigan, and Pilipinas Cup in Clark…not to mention many cities he goes to in-between those big ones. Sadly, he got sick during the trip and played all his matches with a fever. In fact, the on-site medic did not allow him to play the last match, where his team lost to the eventual champions in a tense and heartbreaking quarterfinal match. While I could blame many factors for his sudden sickness, like the city’s dirt, the multiple-hour video game binge he had with a cousin the day before the matches started, the heat, and so on; I cannot ignore that we forgot to pack some things for his performance and health, things that he badly needed. This unfortunate turn of events made me reflect: what are the travelling essentials needed for my son’s optimum performance? Soccer is an intense sport often played under intense heat, and so every trip has to be planned carefully so that he’s peaked and ready to win. Of course, perfect planning doesn’t always happen (like this trip), even after years of travelling the circuit; but what does it look like when you nail it? Here’s what I think should be packed to optimally fuel your favorite athlete. Ready? Let’s go! Tis the season for Balikbayan Boxes! Here are the best items to send, IMO. 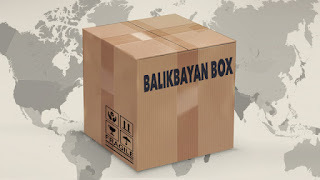 Now that we are in the “ber months,” which here in the Philippines means that it’s the start of the longest Christmas Holiday season in the world; it also means ‘tis the season of the Balikbayan boxes coming from abroad to the motherland. For nearly every Philippine-based family, receiving these boxes from their generous relatives abroad is a cause for celebration. Though very much appreciated, for me, it does give me some reason to groan, unless the relatives abroad know the right things to send through Balikbayan boxes, at least my opinion of such. Read on. To this day, one of my most commented-on and beloved articles is the Buy Pinoy experiment article made way back in 2011. It tells of a favorite assignment I give my students, based on one of the chapters of Alex Lacson’s bestselling book (required reading in the school) 12 Little Things Every Filipino Can Do To Help Our Country. For a certain time (now about a month, but in the article it was just a week), my students have to list down 12 imported things that they usually patronize, and replace them with Filipino counterparts. Read up on my students’ thoughts on this project here, the aforementioned blog post. 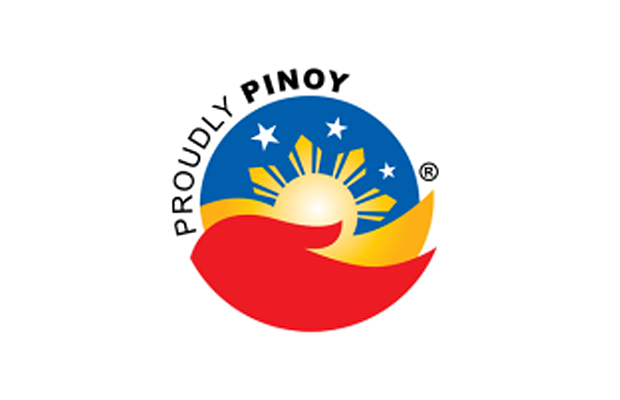 It’s about time for another update for that article; and this time, it’s about 12 Filipino brands or products that we personally patronize as a family. We feel good that these products are made by Filipino hands, and the making of which brings much-needed sustenance to Filipino families. Sadly, one of the reasons I came up with the idea for this article is that many of my students have absolutely no clue what a Filipino-made product is. You’re probably like them, too; and so this article is for you as well. Indeed, we all owe a debt of gratitude to our mothers. They’ve sacrificed so much for us. The Children’s Ministry kids coming out to give their moms roses during the song, us asking them to stand and be acknowledged, the preacher praying for them as they stand…they’re all just little tributes to the amazing women who raised us (and raise our children). To the beautiful mothers out there, happy Mother’s Day, from Lessons Of A Dad. This is gonna a be a very busy several days for me, so I am not sure if I can have time to make a New Year’s blog post (I have one in my drafts half done). …my theme song for 2012. 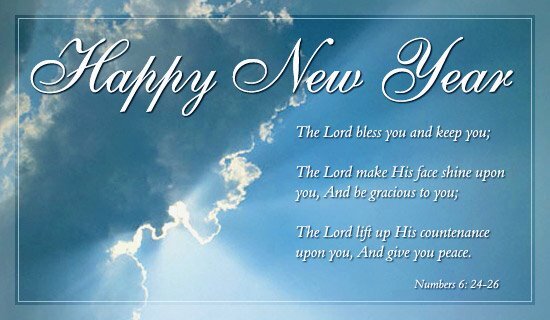 I’m hopeful for a lot of things in the coming year, but what I want most of all for my family is that 2012 is the year we serve…mightily. This beautiful song by John Waller (you may know him from his song “While I’m Waiting” from the movie, Fireproof) sums it up so, so well. Once again, Happy New Year, everyone! It’s November 1, a day where everyone here in the Philippines honors the dearly departed by laying flowers on their graves and hanging around in the cemetery all day. I thought, growing up in the states, that this was a weird Filipino tradition, until my dad suddenly died and then I started to understand how nice it was to do so (and Oro Gardens having a cute playground for the kids doesn’t hurt, either). Now Jhean’s maternal grandmother died recently, and she’s now driving all the way to Talisayan with her dad so that they can lay flowers on the stones of her paternal grandparents. This is one blog that’s pretty difficult to write. My lolo (Filipino for “grandpa”) Trinidad, the father of my mom, passed away last night, just a few days shy of his 91st birthday. He was a lion of a man. He had many skills and was able to not only provide for his kids’ needs, but was able to mold them into successful people. Every one in my mom’s generation and mine are doing well for themselves, and all the married ones have remained married (I know that just sounded weird, but it seems every family has at least one member who has gone south in these areas, but by God’s grace…and likely lolo’s training, the family has been spared). Now that’s being a great grandpa. Being away for so long, I wasn’t able to spend a lot of time with him, but since he and my lola often visited us in the states, some memories were made. Easily the most memorable experience was when I had my 2nd lung operation and my parents had to work. Who nursed a hurting teen back to health? Lolo. It was awesome how he fed me and spent time with me. We’d watch hours of tennis and debate who was better, Andre or Pete (although both of us were Agassi fans). His great service sure made the post op pain bearable. I didn’t need my medications that much. Another great memory was when he bought me a car, then took it for a drive with me at the passenger side. Being the good American driver, I always followed the lines and stop signs and all that. But where lolo came from, lines are just for decoration (in fact, he didn’t know they were lines until I screamed it out to him). So you can imagine an old man driving Filipino style in an American suburb, with me screaming my head off at first then assuming the fetal position later. Well, let’s just say that lolo would be proud of the way I drive now (I can’t wait to drive my Fil Am friends around…now they’ll be in the fetal position). Me as a little kid (probably Mesoo’s age now) slamming the car door on his hand. Ouch. Me as a newly minted teen being totally embarrassed that an old man beat me 6-0, only for me to thrash him with the same score in the rematch (was he taking it easy on me?). The family going up Mt. Baldy, with my dad driving and my lolo in the passenger side. Me being the impatient kid, I asked the usual “are we there yet?” questions. My lola then said, “Yes we are. (pointing to the window) Here’s the Mt. (then pointing to the back of lolo’s head) there’s the baldy”. That made my day. When I was a little kid, I once asked “Lolo, are you loaded?” (“loaded” being an American figure of speech for having lots of pocket money). My mom relayed the story one day, and so when lolo came to visit, it was the grandkids (Lynn in particular) who asked “Super lolo, are you loaded?”, much to his amusement. The loaded super lolo treating all the great grandkids to Hong Kong. The little ones had a fantastic time, but it was the first time for me to see lolo so weak as he trailed behind the rest of us in Ocean Park. There were so many others, but that’s all I can think of right now. Is the family sad? Am I sad? Maybe we should be sad because we lost the family patriarch and a dear friend. But he’s free. Free from his feeble, nearly 91 year old fleshly body that tired every time he climbed the stairs and limited his walking to a slow crawl. Free from the irritating tube that fed him for so long. And best of all, he’s walking down streets of gold, basking in the glorious presence of our Creator. If anything, that should make us happy. He’s in the greatest place in all creation, and here I’m stuck in the Philippines. 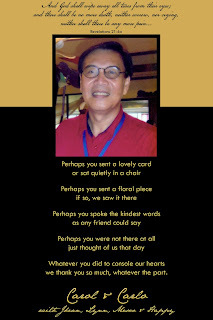 So goodbye my lolo, my friend. You weren’t perfect, but I’ve never seen another grandparent measure up to you. I hope that I’ll be to my children what you were to my mom and her siblings; and I hope I’ll be to my children’s children what you were to me…and those are huge shoes to fill. Today marks two years since the day my father died. We laid flowers on his grave on the way to bringing my daughter to youth group, and I can tell that a shrapnel of pain of the sudden loss is still in the minds and hearts of my children. He was a great, great grandpa to them and they miss him dearly. I was thinking of writing something about what took place on September 10, 2009 and the manic days that followed, but I think nothing can top the blog post that I wrote right after it all happened. Since many of you, if not most of you, have not seen that post (the blog, on Multiply, was just a personal journal that was frequented by my friends only), I will re-post it here. It’s been a long, long time since I blogged, and there’s lots of writer’s rust swimming around my head. But if there’s a reason to express myself through my keyboard again, it’s the topic at hand. It’s taken me a while to muster up the energy to write even this, but I have to get this off my mind before too much time passes and the moment is gone. Before I go on to write about my dad’s death in more detail, I’d like to sincerely thank all of you for sending us your heartfelt condolences. Whether you visited us at the wake, you sent messages electronically, or simply thought about us, thank you. A special mention to those who never left our side through this crazy time; those who took up the cudgels of food, refreshments, and other administrative tasks; those who blessed us with song, God-glorifying messages, and testimonies…thank you from the bottom of our hearts. You know who you are. God is so, so good. It’s as if my dad was so dear to Him that He gave him the best possible way to go out. Heck, the tennis court was already heaven in my dad’s mind. Then there’s the quick demise. Papa was spared the slow death that he was so fearful of, a death that the stage 3 cancer that struck him just 2 years ago made a frightening possibility. We’d joke around that he’d be the crankiest invalid on the planet if he would die through the cancer. Even joining the ranks of the senior citizens was not a pleasant thought to papa. But instead, there was no sign of struggle, no screams of pain, he just fell down and that was the end. He was a year short of the senior citizen benchmark. I’d like to think that God sent the cancer as a heart prep for all of us. He wouldn’t use the disease to kill my dad, but it was an instrument to make the family, especially papa, aware of our own mortality. While he has been a true blue believer for quite some time, he really dove into his relationship with the Lord since the disease. People have noticed his spiritual side bloom. He has been quite devout since we started worshiping at CCF, but lately he truly was a spiritual leader in the family. He gave a testimony at our church, boldly proclaiming to all in attendance that God healed him (he even sang the Don Moen song, I am the God that healeth thee). There was not a dry eye in the building. Yes, God healed him of the cancer, and then mercifully brought him home Sept. 10, 2009. It is interesting to note that I felt a lot less grief than I expected. In fact, many noticed how we, especially my mom, were holding up quite well. I remember years ago, as my friend and church mate Ian Kwan lay dying in the emergency room, his mother calmly told the doctor desperately trying to save his life to let him go. And during his wake and funeral service, I see “Mommy Nene” smile, warmly receive guests, and bear the death of her only son admirably well. Then I think of another CCF friend, Neil, who said that when his dad died, they were singing praise songs in the hospital. 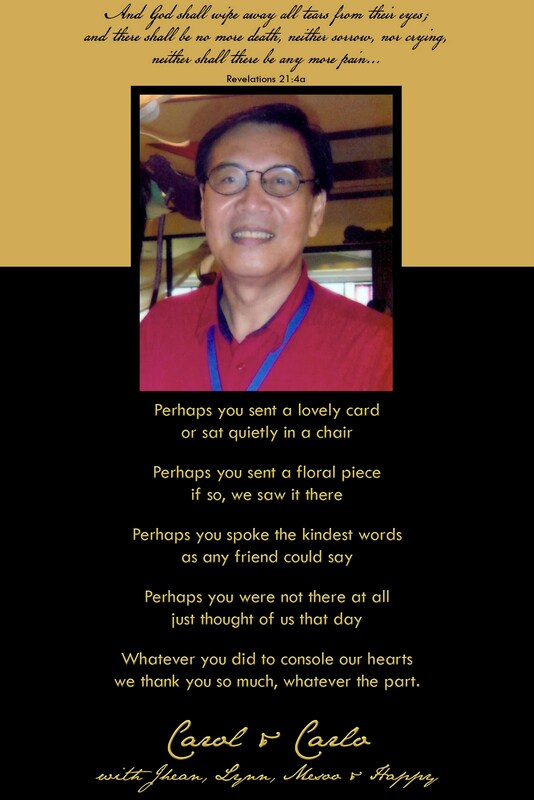 Now it was our turn to bear the brunt of the passing of someone we so dearly loved. And the wonderful God who gave both Nene and Neil the strength to bear this great loss was also the God who held us close and gave us this strange, supernatural sense of peace and fortitude that I can’t effectively describe here on this blog. Nene mentioned in Ian’s funeral that “it’s easier to let go when you know where he’s going.” Amen. One thing that gave us so much strength through this whole ordeal is that we’re so comfortable with where papa is now. I don’t mean to come off as preachy or religiously haughty, but if the Bible that we believe in is true, people who have Jesus Christ in their lives, as my dad did, are promised Eternal Life the moment they leave their earthly life here. I can’t point this out strong enough. While the grief of losing my dad is quite great, the joy that we have knowing that papa now is in the most privileged place in all creation outweighs and nullifies that grief. Furthermore, there’s also a future hope that we, who also have been given eternal life, will see him again once it’s our turn to cross that canyon. Now I know firsthand how the following verse feels. We may not have papa around the house anymore, but death was not victorious on September 10, 2009. My dad is at this very moment in the most enviable place imaginable; and we will see him again one day. And to that, I say Hallelujah!